Going through major risks in today's global economy. The risk of picking weak businesses as"bargains." Since the start of 2016, the S&P 500, the Dow Jones and the NASDAQ are down by 8.8%, 8.3% and 13.4% respectively. This market environment makes it very hard for investors to earn significant returns. More than that, it pushes many investors to more advanced, higher-risk investment tactics such as options trading and short selling. It is crucial to understand the root driver behind any correction. In general, a correction can be traced to two main conditions. The first condition is overvaluation. When valuations are stretched, many investors are sitting on profits. When they begin to have a heightened awareness of risk, they begin to take profits. The market corrects, slashing valuation multiples. Sometimes it is just one sector that is extremely overvalued, as in the dotcom boom of the late 1990s. Other times it is the market as a whole that is overvalued. In such scenarios, even companies that are not overvalued can see their shares suffer. Investors rush to sell in order to limit their exposure to a particular sector or to capital markets in general, not just to overpriced businesses. In the wake of such a selloff, many great businesses are offered at a bargain to the savvy investor. The second cause is real business weakness across the board. 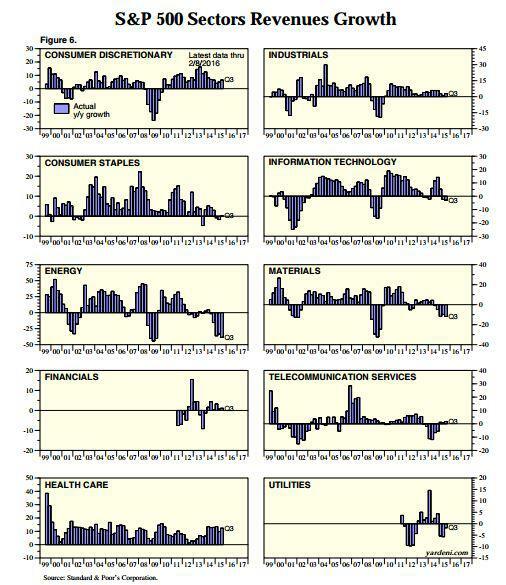 This means sales are dropping in many sectors, profits are shrinking, and weakness is seeping from sector to sector. Weak consumer demand leads to less manufacturing, which impacts capital spending, and so on. The dominoes begin to fall. To misread the causes of a correction is to invite disaster. Let's say you think a selloff was simply a revaluation of a stretched capital market full of healthy businesses. You purchase a stock solely because its P/E is now much lower than it was before. It may look like a bargain today, but if sales and profits are about to shrink because of broader economic weakness, the P/E will soon rise even if the stock price remains the same. It will cease to be a bargain regardless whether you see any return - and perhaps even if the price falls further. Also you must understand that things change fast. Let's say you invest in a great software business whose main customers are Fortune 500 companies. You think that global weakness stemming from household debt isn't much of a risk to your investment. But when a household revises its budget in order to repay loans, discretionary spending is the first thing to go. Fortune 500 companies who sell discretionary goods - or products to companies that benefit from discretionary spending, such as restaurants - see revenues fall. In an effort to maintain profitability they cut expenses, starting with "good-to-have" software solutions. Suddenly the software company in which you invested starts to lose clients quickly, and its sales and profits shrink. The dominoes fall. Today I want to offer a broad analysis of the risk of global business weakness, not limiting the focus to one specific sector but looking at the market as a whole. The three main risks to the global economy today are: Debt, China, Frugal Consumers, and Negative Interest Rates. After the 2008 credit crisis, many world governments tried various monetary tools to jump-start their economies. They lowered interest rates to ~0% and made extremely large monetary expansions through QE in the U.S. and similar programs in the European Union. Thus, not a single government has deleveraged, or lowered its debt-to-GDP ratio, since 2007. Not a single one. Government debt has risen by $25 trillion since 2007, reaching an unsustainable level in many countries. Household debt, corporate debt and finance debt have also grown considerably, resulting in a world that is far more leveraged in 2007. Source: McKinsey study: "Debt and (not much) deleveraging"
The only countries whose households deleveraged were those that suffered the most (Spain, Ireland, UK, US) after the 2008 crisis. Most other countries' households took on more and more debt in relation to income. This brings us to a couple of interim conclusions. 1. It's increasingly hard to deleverage. When individuals, households, corporations and governments are faced with the question of whether to take more debt (to finance growth) or experience lower or even negative growth, they choose the former almost every time. This unfortunately appears to be human nature. Home-buyers pre-2008 opted for the immediate gratification of growth (by buying a better/new/second home/second mortgage to finance a more luxurious lifestyle), even though for many it spelled almost certain future pain because the debt that financed it was unsustainable. Parties with unsustainable debt loads eventually reach a breaking point. Either they slash expenses in order to make debt payments or they default. Each scenario has deep implications for economic growth. Consumers cease buying not only discretionary items but sometimes even staples. As consumer spending contracts, corporations do all they can to hold on to profits, such as lay off employees. As tax revenues contract and more citizens require services, governments have to make deep cuts to budgets on which both corporations and their employees rely. 2. New loans are of diminishing quality. A financial institution takes on little risk by loaning $10K to a debt-free household with income of $100K/year. If the household has $200K in debt, the same $10K loan is much riskier. Financial institutions that are in the business of creating credit must lower the quality of the loans they sell if they want to grow or even maintain revenues. This leads to sub-prime lending, which over time can lead to mass defaults and full-blown crises like the one in 2008. To conclude, the debt situation across the world is worse than it was in 2008. We should be prepared for another credit default crisis in one or more markets. The risk is much higher in foreign countries than it is in the U.S.
For many years, economist have worried what would happen when China's economic growth slowed down. For 3-4 decades, the Chinese economy has grown at a rate unparalleled in human history. The past 15 years have seen tremendous development, mainly around urban pockets. The growth depended mainly on infrastructure development and exports. More recently, consumer spending started to grow to a meaningful base, but is still far too small to support a consumption-based economy. Growth still relies on infrastructure and exports. Debt has grown 4X since 2007, from $7 trillion to $28 trillion. 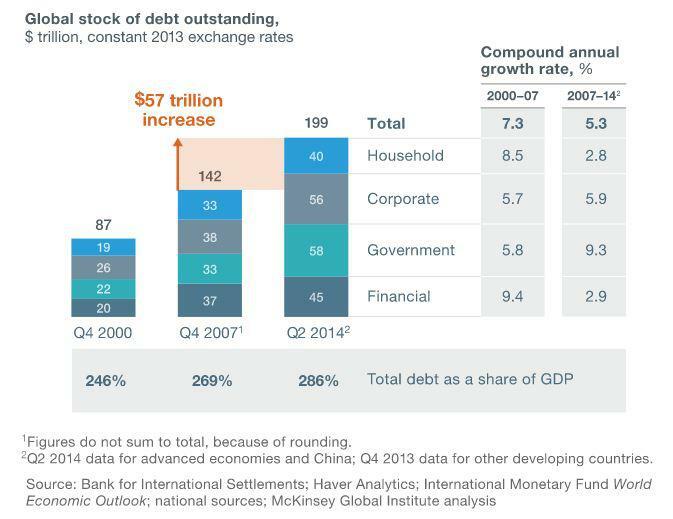 In a mere 7 years, China became more leveraged than the United States. Extremely quick growth, whether by companies or by countries, always hits bumps along the road, and there are always unintended consequences. Consumers in China started from a very low income base. As their net worth multiplied, they looked for investment instruments. The investment landscape in China isn't as developed as in the Western world. Faced with few viable alternatives, many earners chose to invest in real estate. One of my colleagues in China told me a few months ago that it isn't unusual for one person to own 6-7 apartments in certain 2nd-tier and 3rd-tier cities. Most are sitting empty because supply grew much faster than demand. It's quite simple to understand the reason. Real estate developers figured out they could build a huge inventory of apartments and sell them as investments to the newly-wealthy (relatively speaking). It was a dangerous path, and it couldn't end well. China now has enough real estate inventory to supply several years' worth of demand, which stems mostly from farmers and villagers migrating to cities. China's credit market is also wildly underdeveloped. It is rife with unregulated shadow-banking institutes that offer loan-shark rates. These supply 15%-25% of outstanding debt, according to various estimates. What happens when China has its own sub-prime crisis in one or more domestic markets? 1. China's debt will become unsustainable in the near future, not necessarily nationwide but rather in one or several domestic markets. The riskiest industry in my view is real estate development. MGI calculates that China's government has the capacity to bail out the financial sector should a property-related debt crisis develop. The challenge will be to contain future debt increases and reduce the risks of such a crisis, without putting the brakes on economic growth. Therefore it is very likely that growth will continue to slow. It may experience a sharp decrease should a credit crisis occur. As U.S. households became less leveraged, they didn't increase their spending. Instead, they started saving. The U.S. economy would have recovered more quickly if consumers were willing to spend more. Instead people set aside their cash. The beneficiary was the stock market. With 0% interest rates in place, there was little reason to invest in fixed-rate accounts. It seems the majority of spare income flowed straight to the capital markets, driving an amazing 6-year bull market. In order to demonstrate this point, let's look at the velocity of money (M2 money supply). The velocity of money measures the average number of times each existing dollar is spent on the purchase of a final good or service in given year or quarter. Today we observe the lowest ratio since the 1960's. It was 1.48 in Q4-2015. Money moves 26% slower today than in 2008, when the ratio was roughly 2, and even slower than in 2009, shortly after the credit-bubble burst. There is more money (thanks QE! ), but the increase in supply has not correlated with a proportional increase in spending. This demonstrates that much of the new money went to savings and investments. The philosophy behind QE was that lowering interest rates and making money more available would prompt people to spend more money on goods and services. Clearly this did not happen. That leads me to the final point of the analysis. A small Austrian town named Wörgl ran an experiment back in the Great Depression. It invented a new form of money called stamp scrimp. Imagine a dollar bill with several spaces on which a stamp can be placed. Each stamp cost 5 cents, and each month you need to place a new stamp on the bill. Without a the latest stamp, the bill is worthless. This mechanism incentivizes the bill holder to spend it as fast as he can. His salary loses its value quite quickly, so to enjoy its value he must purchase goods or services sooner rather than later. The Wörgl experiment resulted in a significant increase in employment and economic activity in the midst of the Great Depression. Meanwhile, neighboring towns experienced a deep recession. The idea behind negative interest rates is basically the same. There is a strong incentive to spend money because it loses its value if it sits as cash. On the other hand, one could in theory make money simply by borrowing. This idea has many flaws, of course. A simple strategy in this environment would be to burrow as much money as possible and invest it in an asset. You collect interest from the bank from which you borrowed and enjoy the stability of owning an asset, with the hope it will appreciate in value. In reality, though, only banks have access to negative rates, because the central banks set only the inter-bank lending rate and not retail lending rates. Negative interest rates mean banks will have to pay the central banks for funds they store in reserve. Retail banks will therefore offer very close to 0% interest on savings accounts and offer ultra-low rates on loans in order to get funds out of reserve. Retail banks won't offer negative interest rates, however, since they would quickly go bankrupt from handing out effortless returns to borrowers. Negative interest rates convey to the public that central banks are worried about the economy. This will make people even more reluctant to spend. The public will either store money in cash accounts to avoid risk, or it will take on risk by investing. In a negative interest rate environment, we suspect the average person will be even more risk-averse, so the latter is unlikely to happen. There is some data behind this claim. In June 2014, the ECB cut its rate to -0.1%. Since then, European stocks have been falling, showing that negative interest rates result neither in GDP growth nor rising capital markets. In my view negative interest rates are unlikely to prompt people to spend more money. Instead, in addition to lowering returns on savings, they will make consumer sentiment worse. When people believe the future is bleak, they hoard cash. Corporations do the same. Today they all have good reason to think the future of the world economy is not pretty. How will governments respond to cash hoarding? Will they institute Wörglian policies? And how will earners respond to the disincentive to save within the banking system? What alternative instruments will become most favored? These are questions you should be considering. Having reviewed major global risks, let's look at capital markets to see if we can identify weakness in certain sectors. Most sectors are already experiencing negative revenue growth. The two exceptions are Health Care and Consumer Discretionary. Revenue growth for the consumer discretionary sector has been slowing down since 2012. 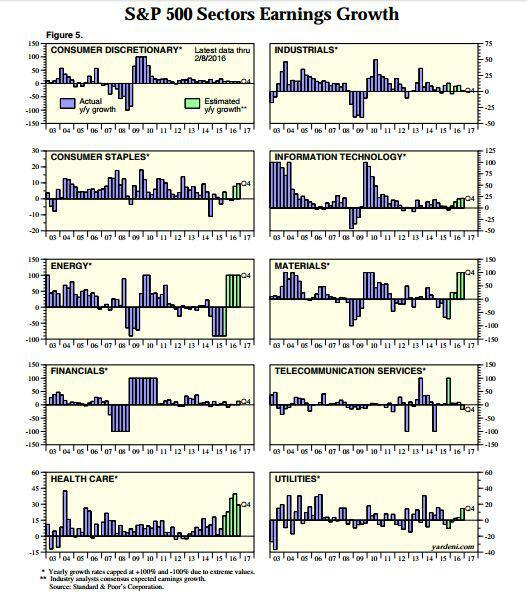 Most sectors other than Energy are enjoying their highest profit margins since 2007. We see a slight decrease in profit margins across the board, which is likely attributable to the decrease in sales in those sectors. An interesting situation is developing across the market. Analyst estimates (shown in green bars) call for earnings growth in almost every sector in 2016. Judging by price action, Mr. Market isn't buying what the analysts are selling. 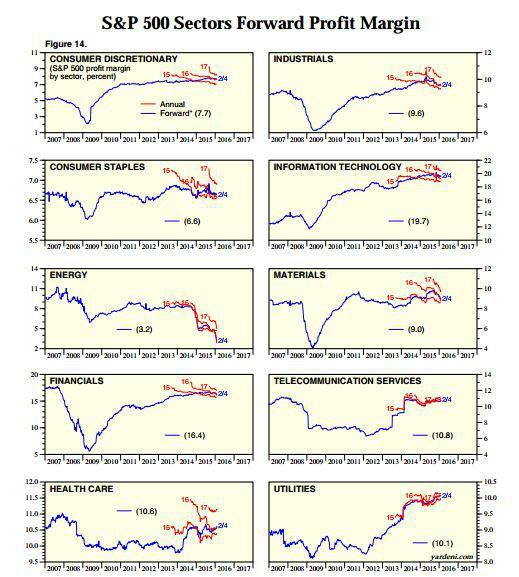 It's important to note that earnings in the consumer discretionary sector are quite stagnant. This tells us the growth in revenue doesn't trickle down to the bottom line. We have reviewed global risk in an effort to determine whether this correction is a temporary revaluation of a healthy, growing market or an acknowledgement on the part of investors of actual business weakness. It seems the answer is both. Much of the market was overvalued. Some stocks have been punished more than others, and with good reason. Unlike other recessions in history, the one in 2008 was not followed by a period of deleveraging and risk mitigation on a global level. The global economy is more leveraged, and much GDP growth was driven by a disproportional increase in debt. There is little doubt that China growth will continue to slow down for at least the next few years. The main issue is the possibility of a bubble bursting and the government's attempt to contain it (which it may be able to do). Frugality continues to be the norm among consumers. Many individuals and corporations around the world are hoarding cash. Negative interest rates are no panacea and may in fact exacerbate the problem. The U.S. is still the safest place to be, but this is a time for careful stock picking. Do not purchase a basket of stocks. To mitigate risks, choose businesses that can flourish even if all the risks above materialize. Avoid businesses whose sales are tied to consumer spending, in particular discretionary spending. Earnings growth isn't there, and discretionary expenses are the first to go in bad times. Generally, start to accumulate cash so you can pull the trigger on bargains that will slowly begin to appear as the market selloff unfolds. Be patient. Focus on businesses that sell products or solutions that enable other companies to cut costs. These will likely see increased demand going forward. Focus on big, unstoppable trends. Focus on data growth for example, a trend that is unlikely to stop even if all these risks materialize. Avoid using screeners or any other investment decision tool based solely on a valuation metric. When the selloff is based in part on stretched valuations and in part on real business risks, its more likely today's bargain will turn out to be tomorrow's loser. Nobody is a clairvoyant. All we can do is use a reasonable strategy that takes into account everything that we know and a fair set of assumptions about the future. None of the risks the world is now obsessed with have 100% odds of materializing. It is even possible (though very improbable) that none of them will bear out. Remember, great investments were made even during the 2008-2009 period as well. You just had to be more picky. I believe this is a time to turn up the "picky" dial on your portfolios. With all this in mind, I want to introduce a way to qualify potential investments in 2016. I crafted a test that individual stocks must pass before I will consider holding or buying them.